We got a new, high-end, coffee machine at work! To see what happened the first time I used the machine, play this brief video (for pc, for apple). If you can not see what happened, I will tell you. The machine brewed a cup of coffee for me and then dumped it onto the floor! Why? I followed the 3 steps on the machine, pictured at left. (My choices are indicated with arrows.) Why did the machine dump my coffee onto the floor? Because I was supposed to supply the cup into which the machine was to put the coffee. I expected the coffee machine to dispense a cup. 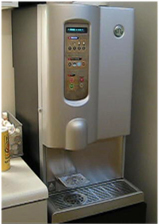 Coffee machines usually dispense cups. The step-by-step instructions mentioned nothing about me providing the cup. Am I only one who made this mistake? No. A friend who was visiting experienced the same problem. 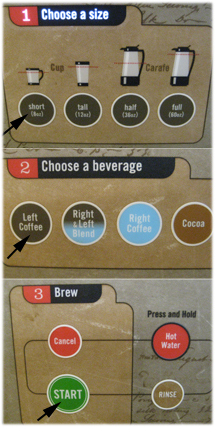 After cleaning my coffee off the floor, I noticed an instruction card on a counter next to the coffee machine. The step-by-step instruction card, pictured at left, showed a new step #1. The new step was: "1. Place a cup on the serving platform." Putting this instruction on the machine, would have solved my problem. Copyright © Michael J. Darnell 2010. All rights reserved.